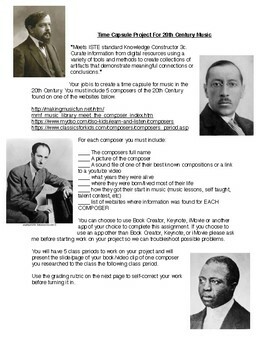 Students research various composers of the 20th century and create a digital time capsule to represent their findings. Works best if your school has access to iPads or MacBooks. 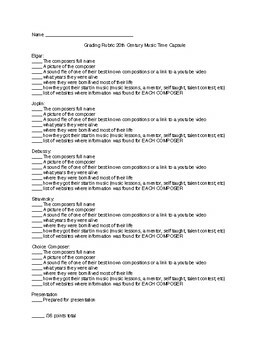 I use this project with 8th grade general music at the end of the year, but it can work with almost any middle school or high school general music class. Includes a grading rubric. Takes about 4-6 class periods depending on how fast your students work and how long your presentations take. Meets ISTE standard 3 Knowledge Constructor c. curate information from digital resources using a variety of tools and methods to create collections of artifacts that demonstrate meaningful connections or conclusions.